A line of thunderstorms produced strong winds, tornadoes, and flash flooding from the ArkLaTex region into the Ohio River Valley during the afternoon and evening of 24 February 2018. These storms developed in response to a progressive, negatively-tilted shortwave trough (Fig 1) and associated deepening surface low advancing into the great lakes region and trailing cold front. Organized convection in an atmosphere characterized by anomalously high TPW over already saturated soils meant flash flooding would be a key threat with this event. WPC had issued a high risk for excessive rainfall. The Blended TPW product indicated values in excess of 1.4″ spreading over the region during the day (Fig 2). Blended TPW, generated at NESDIS, combines information from polar-orbiting satellites, GPS, and GOES satellites. These values were over 200% of normal (Fig 3), based on a weekly climatology. The blended Layer PW product, generated by CIRA, showed locally high amounts of moisture extending vertically through the whole atmosphere over a large region (Figure 4). The GOES-16 Rainfall Rate product utilizes ABI IR imagery and Microwave-derived rainfall rates (which serve as calibration targets for the algorithm) to identify areas of rainfall and retrieve an instantaneous rainfall rate. Microwave-derived rainfall rates are the more accurate estimates from satellite, but are not available on a continuous basis. The GOES-16 ABI product updates every 15 minutes over the full disk at a spatial resolution of 2 km. While rain gauges and radar estimates are the primary datasets used by forecasters to monitor rainfall during heavy rain events, satellite rainfall estimates can be useful in remote areas. During this event, the GOES-16 rainfall rate product captured the heaviest-rainfall-producing storms as they moves across the southeast. In figure 4, the 15-min rainfall rate product (interpolated) is overlaid with NWS Flash Flood Warnings. On Thursday, February 16, 2018, Volcan de Fuego in Guatemala had another set of small eruptions that released periodic bursts of ash. The Washing Volcanic Ash Advisory Center (VAAC) requested a Mesoscale Domain Sector from GOES-16 to monitor these ash plumes for their advisory. The animation below shows Fuego near the center (yellow circle) with puffs of ash emanating off the summit from ~1400 UTC to ~2000 UTC. A snapshot of the MDS focus showing Volcan de Fuego (yellow circle, center), Volcan de Santa Maria (lime green, left), and area of small agriculture fires (white oval, right). Click here to enlarge. GOES-16 0.64um visible animation of ash emanating from Vulcan de Fuego and smoke blowing offshore in southern Guatemala. Click here to enlarge. According to Ellen Ramirez (SAB Analyst), the MDS provides more situational awareness, especially during small events that would otherwise go unnoticed at 15 minute increments (current Full Disk operations). For instance, at the beginning of the above animation, you may notice a small puff of ash/gases from Santa Maria that would have been missed if it weren’t for this MDS request. The continued ash/gas releases from Fuego are also much easier to analyze and might have been missed if they appeared between 15 minute scans. Additionally, if you look just offshore the southern Guatemala coastline, you may notice smoke blowing offshore associated with small (assumed) agriculture fires. GOES-16 has supported NWS Decision Support Services (DSS) activities associated with the Super Bowl during the week leading up to (and including) Super Bowl LII in Minneapolis, Minnesota. Mesoscale sector 2 has been centered over the Twin Cities since Jan 28, providing forecasters with continuous 1-min satellite imagery across the region. Elevated DSS activities is the number 5 priority for GOES-16 MDS requests. The main weather impact for Sunday (Feb 4) would be very cold temperatures, with highs staying in the single digits, and lows falling below zero. Morning wind chills across Minnesota were less than -20 degrees. 1-min visible satellite imagery the morning of the Super Bowl showed clouds clearing out of southern Minnesota, giving way to clear skies for the day and revealing fresh snowfall left by the exiting storm system (Fig 1). A broad view of GOES-16 5-min infrared window imagery shows the very cold air being ushered into the north-central US (Fig 2). 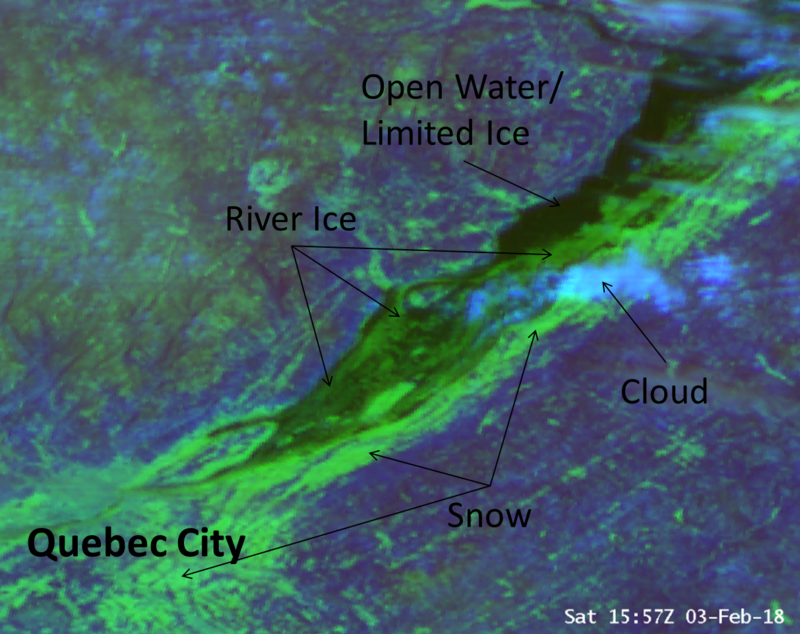 GOES-16 5-min visible imagery captured the flow of ice through and east of Quebec City on 3 February 2018 (Figure 1). The open river has the lowest reflectance (almost black) while the ice has moderate reflectance (gray) and snow (and clouds) has the greatest reflectance (lightest gray to white). The Day Cloud Phase Distinction RGB (Figure 2) better highlights the ice (deep green) versus other features such as snow (light green), water (dark), and water cloud (blue/aqua).